The motorcyclists were up early this morning. I heard the first ones racing up the road at about 6:00 this morning. I guess that’s a good time for them, as there were practically no cars on the road, so that they pretty much had it to themselves and could go as fast as they wanted – and they did. A view of a portion of the old road on the north side of Grimselpass.This part is now the bicycle path that bypasses the new tunnel. The road was carved out of a rock face and they just left a large rock overhang over the cobblestone road. Pretty cool. This was my impromptu campsite last night. 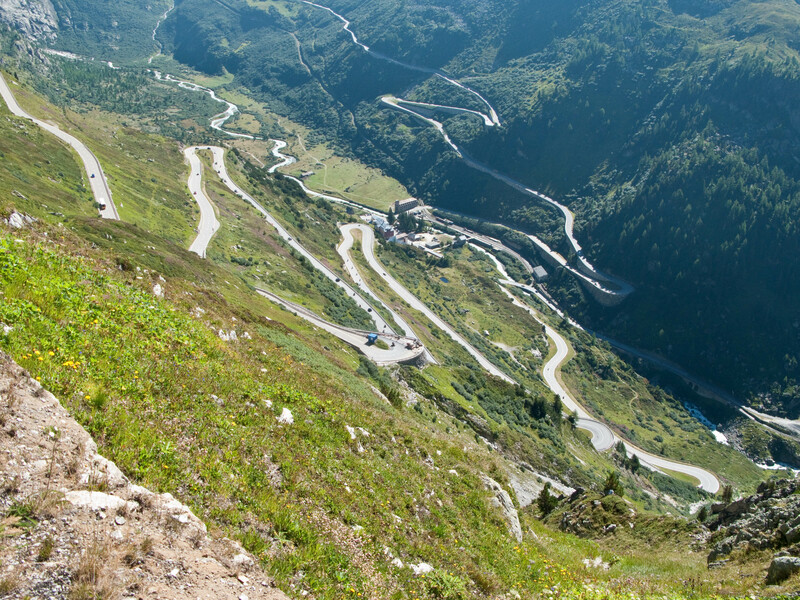 View of the north side of Grimselpass, showing a portion of the road leading up to the pass. Ahhh - the top at last. Let the downhill ride begin! I got moving at 7:30 am and climbed the remaining 2,500 feet to Grimselpass, arriving there at 9:30. The elevation at the pass was 7,117 feet – my highest altitude so far on the trip. This being the weekend, and a sunny one also, there were hundreds of motorcycles in the parking lots of the restaurants at the pass. And in addition to the motorcycles, there were lots of fast cars also. A Lamborghini, several Corvettes, too many Porches to count, and even a classic Ford Cobra passed me on the way up. When I got to the pass the Lamborghini and the Cobra were parked next to each other. Lots of people were milling around gawking at them, and so of course I had to get a few photos as well. Before leaving the pass I had lunch at one of the restaurants. I had Rosti, which is sort of like hash brown potatoes, with bacon, cheese, onions, and tomatoes mixed in. Very tasty. Grimselpass... a show place for fast and exotic cars. Here's a Lamborghini that rocketed past me on the way up to the pass. And here's the Lamborghini with an even more exotic neighbor... a classic Ford Cobra 427. The Cobra is a very rare car, and I was very surprised to see one in person. Together, these two cars drew quite a crowd of people around them. Very impressive. Who needs fast and exotic cars when you have a rig like this, my bike? Park it anywhere, and it's light enough to carry up steps. But 0-60 in never! After lunch came the moment I’ve been looking forward to for the past six months – the descent from Grimselpass down to the Rhone Valley. It didn’t disappoint. The road had 13 switchbacks and descended 3,600 feet over a distance of 13 kilometers. I made it to the bottom in 45 minutes, but that was with a lot of stops to take photos. What a ride! It was a real blast taking the hairpin turns as fast as I dared, but what was even more amazing was watching the motorcyclists. They’d lay their machines over at such an angle going around the curves that I was sure they were going to slide out and go over the edge of the road. But none did – they know what they’re doing. The moment I've waited six months for - the ride down the south side of Grimselpass. 13 hairpin turns and a 3,600 foot descent! View of an old barn in a village in the Rhone Valley. It's interesting that it seems to be balanced on top of the circular stones on wooden columns. This was a common sight throughout the Rhone Valley area. I'm not sure why they're built this way. Maybe it keeps mice and other rodents from getting into the barn. Here's a close-up of the stone/column support under the barn. There were eight such supports - one at each corner and one in the middle of each wall. After reaching the Rhone River valley, it was a quick 48 kilometers, all downhill, to the town of Visp. It is located at the bottom of the valley that leads to Zermatt and the Matterhorn. Since it was still early in the day I found a campsite in Visp, got my camp set up, and then took the train to Zermatt for a few hours of sightseeing. Of course I saw the Matterhorn, luckily with no clouds around it except for a few transient, wispy summit clouds. Nice mountain. The mandatory tourist shot of the Matterhorn. Tomorrow’s destination is the town of Martigny, about 65 kilometers west down the Rhone valley. This entry was posted on August 22, 2010 at 10:25 am and is filed under On the Road, Switzerland. You can follow any responses to this entry through the RSS 2.0 feed. You can leave a response, or trackback from your own site. Scott: exactly correct. The large, flat, round stones on the foundations are to prevent rats from climbing into the building. Those buildings were typically granaries. Or so I was told.